« Vote for our video in AGU’s contest! 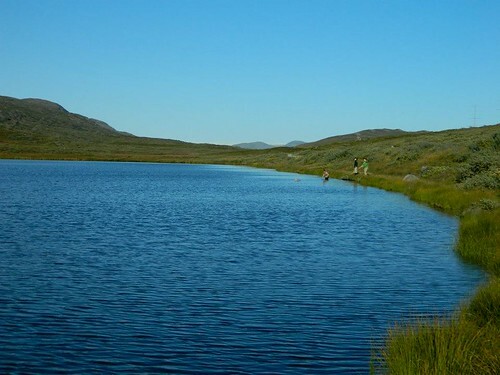 Kangerlussuaq is peppered with lakes and ponds, extending all the way up to the ice margin. There are many interesting questions to be answered with regard to these lakes – for example, what are the nutrient inputs? How does the water chemistry vary between each? What is the community composition of aquatic plant and animal life? And how might all of the above parameters be influenced by the surrounding vegetation and geology? Setting up to take water, sediment, and plankton samples. Photo courtesy C. Vario. 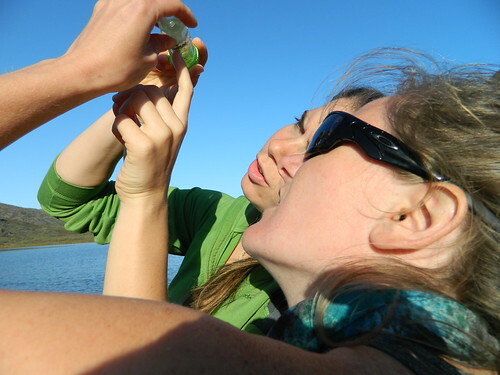 The crew finds sea tomatoes settled all over the lake sediment. Photo courtesy C. Vario. To get at some of these questions, Ali, Chelsea, Stephanie and I headed into the field one last time before leaving Greenland. Together, we sampled four lakes between the town of Kangerlussuaq and the ice margin. 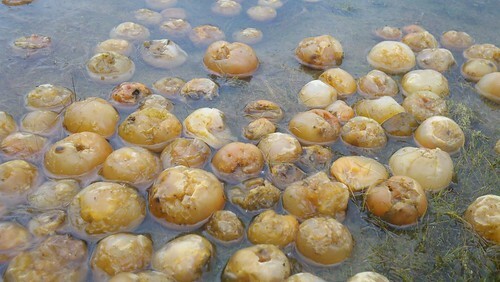 These lakes are especially interesting because of the orange, spherical balls inhabiting them, known locally as sea tomatoes. These fascinating organisms are a species of colonial cyanobacteria belonging to the genus Nostoc. 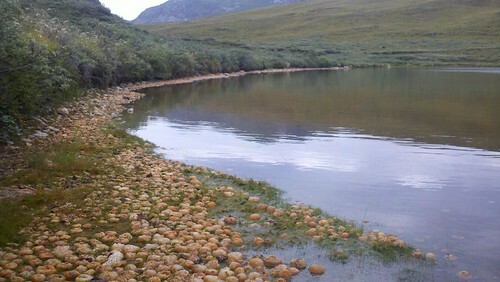 Lakes here are highly variable in their abundances of sea tomatoes, with some having no visible colonies, and others supporting hundreds to thousands of colonies. High density sea tomato lake. Sea tomatoes vary in size, with large colonies reaching the size of a softball. To capture this density gradient, we sampled lakes at four different sea tomato densities, ranging from no visible colonies, to high abundance (estimated to be thousands of colonies). At each lake, we took samples of (1) whole lake water, (2) lake sediment, (3) zooplankton and phytoplankton, and (4) the sea tomatoes. 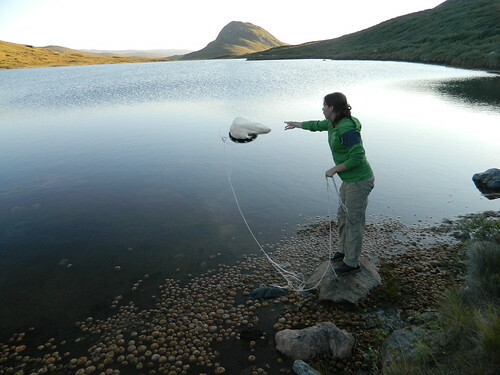 Steph tosses the plankton net into the lake to capture zooplankton. Photo courtesy C. Vario. Back in the lab, I hope to use these samples to better understand the occurrence and distribution of sea tomatoes, including: what are some of the limits to sea tomato dispersal? Lakes with few to no visible sea tomatoes are often situated next to lakes teeming with them; what limits their movement and establishment to certain lakes, but not others? Do high versus low sea tomato lakes show differences in water and sediment nutrient levels? Many species of cyanobacteria, including other species of Nostoc, produce toxins, but we don’t yet know whether or to what extent sea tomatoes in these lakes are releasing toxins into the system. Further, examining the zooplankton will allow us to ask additional questions about the movement of the toxins through the food web and more generally, about the composition of these arctic lake communities. 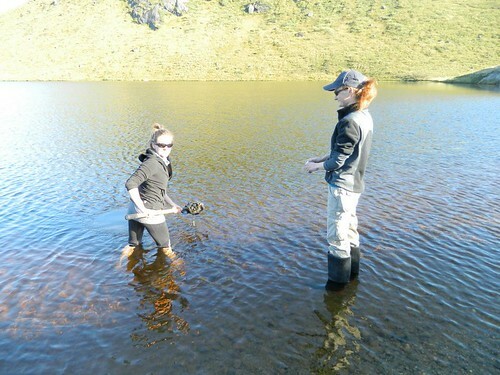 Steph and Jess inspect the fresh plankton net catch. Photo courtesy C. Vario. 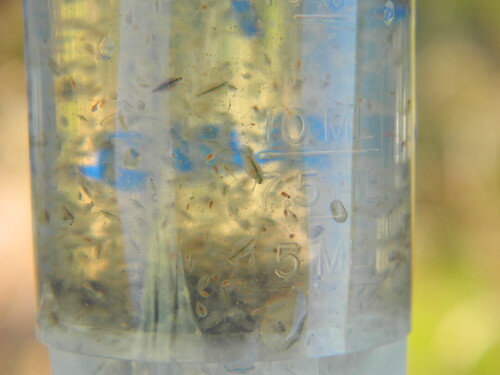 Lively zooplankton dart around the sample jar after being caught in the plankton net. Photo courtesy C. Vario. Fascinating ecology. The productivity of these lakes seems remarkably high.